At the 2015 North American International Auto Show, Volkswagen replaced its female booth babes with an iPad-powered droid that was used to interact with show attendees, reports psfk. The robot replacement moved like a Segway and had an iPad that communicated with those who approached it. 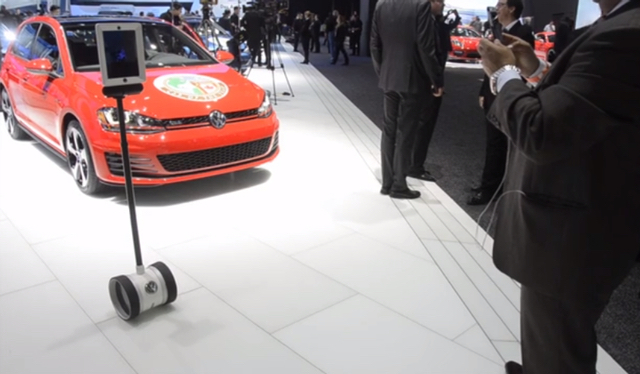 The remote-controlled droid roamed the show floor around the German car maker's exhibit and had the ability to both see and talk to people. The iPad also provided a touchscreen interface that allowed visitors to learn more about Volkswagen automobiles. You can check out the Volkswagen droid and the crowd's curious reaction in the Vimeo video below. Volkswagen replaces booth babes with iPad-controlled robot at 2015 Detroit Auto Show originally appeared on TUAW: Apple news, reviews and how-tos since 2004 on Tue, 20 Jan 2015 10:00:00 EST. Please see our terms for use of feeds.